Preheat oven to 350 degrees. Using coconut oil, extra-virgin olive oil, or grapeseed oil, grease two bread loaf pans. Put water and yeast in mixing bowl. Let yeast get bubbly, about 5 minutes. Add remaining ingredients. Mix until smooth. Fill each loaf pan with 1/2 the batter. Spread evenly with a spatula. 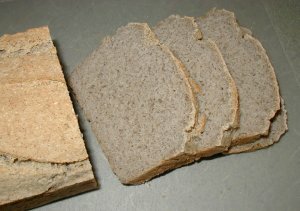 Bake the loaves for 50 to 60 minutes or more, until golden brown and a toothpick inserted in the center comes out clean. Remove from oven. Let cool on rack, in pans, for 15 minutes. Turn loaves out of pans and return to cooling rack. Let cool completely before slicing. This bread is delicious toasted! 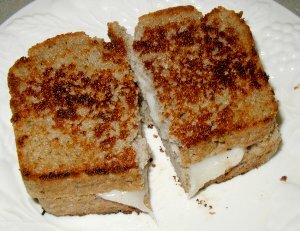 We made grilled goat cheddar cheese sandwiches out of it today. © Copyright 2007 by Wardee Harmon. I’m excited to have found your blog, and look forward to trying your recipes! I have two boys with varying food sensitivities–to wheat, dairy, and corn, among other things. I am having trouble finding enough bread options that they like since we are on a rotation diet. We have some barley bisuits they like, but other things they hardly tolerate! Thanks for the new recipes! Hi, Susan! I have to say that I’m still working on the bread issue. I have a couple recipes to try soon. I hope you’ll visit again when I have more bread choices available! Thank you, Sonya! I would love to try it. I will have to look around for the magazine. I wonder if my library has it. I guess I could also try purchasing a back copy of the magazine. The magazine might be kind of hard to find at your library, as it’s definitely a specialized publication. I can find it at the Whole Foods and Sprouts markets in my area, and I think I’ve seen it on newstands of the major bookstores here, too. You might have luck in those places where you live. I forgot to mention, too, that the recipe calls for “milk powder of choice.” Because we are dairy-free (as I know you are, too), I used Vance’s Dari-Free powder (available from Azure), and I’m sure you could use Better Than Milk powder (also available from Azure), as well. Sonya, I checked today on the Living Without website and they have that issue available for purchase, so I purchased it. I’m eager to try the recipe. My library didn’t have the magazines. I’m glad you were able to pick up the issue, and I hope you find the recipe(s) helpful. 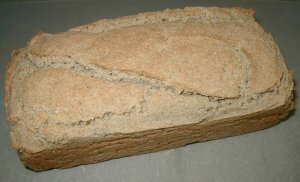 The issue includes both “high-fiber” and “high-protein” flour blends for use interchangeably in the recipe. I had made the “high-protein” variation several times and really liked it. Today I tried the “high-fiber” variation, and it came out wonderfully, as well. Let me know about your experience once you’ve had a chance to try it.